When I wander though these piles of rubble and ruin it just reminds me that nothing, nothing no matter how powerful and thought indestructable, is forever. The universities are the modern equivalent of the monasteries. So how is it countered? It's very simple. Send every tax payer a break down of the state debts. £440,000 per tax payer, plus interest, plus the usual threats about we will jail you if you don't pay. The rubble and destruction is already here. I had passed by ruined Abbey's for many many years. 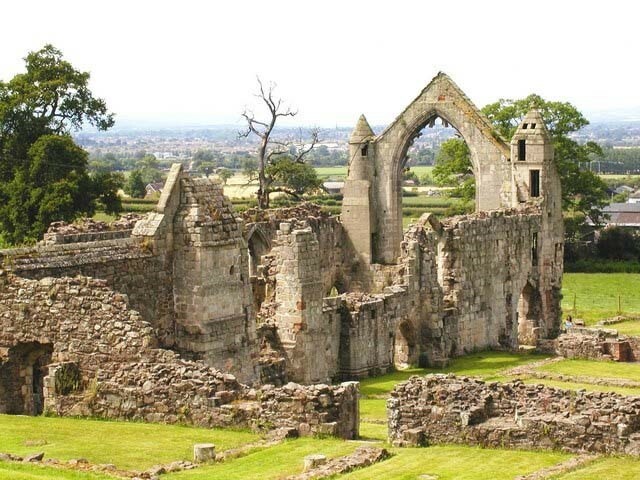 Ruins are a feature of England and Europe. It was a long time and after studying history, until I realised our ruins are, in the main, deliberately destroyed. They didn't fall down through age. They were dismantled. Or blown up. In the Tudor wars and the civil war. This peaceful nation has had as many bloody rebellions as any european country. Just ours were a little longer ago. And if we include ireland, the uprisings and civil war and terrorism,which we absolubtely should, not that long ago at all. Whilst we only today see the ruins as evidence of the church's wealth, its vast forests and farmland were the real prize. In a pre-industrial age these were the industries of the nation, on which we were dependent for both subsistence and trade. I have had to explain to my young German friends more than once the notion that Hitler was not alone in confiscating the wealth of the Catholic Church. In Austria's case it was a two-stage process; the Kaiser, late in his reign, first relieved the church of its vast land holdings here in exchange for eye-watering annual payments. Hitler then ended those annual payments (he wanted the money to make war) and in their place gave the Church a right to impose a 1% income tax of its own on the people of Austria - enforceable in law just as the State tax is, and believe me they enforce it. Catholics either pay or are forced to make a legal declaration that they are no longer Catholics, and are then no longer entitled to the benefits of church membership, including marriage and burial. Hitler did not take their buildings, and the 1% tax has left the Austrian, and the German churches immensely wealthy. You may have read of the Bishop of Limburg's new palace - built at a cost of €31m, with fitted wardrobes for his frocks costing €850k and his designer bathtub €15k. I point out that Henry VIII was somewhat harsher in his seizure of assets than was Herr Hitler. In fact Hitler was comparatively liberal. And also the possibility that Henry did the church a bigger favour - or perhaps it's just my English eyes, used to clerical poverty, that wince and smart at the fat and startling wealth of the Church here. Well, Henry didn't bother with a referendum. Leaving Rome made no practical difference to the souls of the English, life (and death) went on as before. Only few zealots cared much. The analogy with dissolution of the monasteries looks like the breakup of vested interests, interests that were loyal to Rome and thus had to be squeezed and conveniently liberated resources - to Henry. We might look to Parliament and MPs as a vested interest - ripe for a hard squeeze. And of course the wicked old EU, stuffed with Cardinals and Nuncios. In reality just another bureaucracy. Who will get to plunder UK resources is not yet clear. On the one hand more corporate and individual buying up of housing may go apace. A bad thing in my view, housing seems one of the factors leading to dissatisfaction and pushing up the effective cost of labour. If the hard Right gets in then a bit more privatisation looks on the cards - a spot of corporate plunder. Not really what Leavers were expecting. Leave was sold on the idea of Sunny Uplands and £350M/week for the NHS and no more immigrants. Remarkable claims require remarkable proof - and none has been forthcoming. No one believes in Sunny Uplands, the £350M/week has slithered away with Boris and we can't do without immigrants. This is the big problem with a Brexit, there is no spreadsheet, no business plan, just a leap into the dark on the say-so of a few rich Tories who have no skin in the game. At least Henry's advisers had some spiritual skin in the game and would lose their temporal heads if the project went wrong. Back in the days of business process re-engineering the phrase was 'don't fix it, nuke it'. Well we don't hear too much of that talk any more, fixing what you had worked a lot better. Labour does not look likely to get in unless the Tories are very incompetent. In the UK Labour are the backstop when the Tories screw up, they are rarely a viable alternative. But there is a fair chance incompetence will prevail and we get the default. Unless we have a sensible policy on UK-economic-needs-based immigration, and rebuild our industrial base, the Welfare State and NHS are indeed doomed (heavily strained already). I recall reading that most of the money Henry got from raiding the monasteries went out again on pensions for the dispossessed monks and nuns. He never had much idea about money. There is one certainty post-Brexit. There is no game plan. Looking similar to the break-ups in East Europe where in the absence of a plan, a few oligarchs got all the money. Is that what was promised? Disgraced politician, Liam Fox suggests there is a plan, but when pushed he never comes up with anything always blaming others. Disgraced politician, Boris Johnson comes up with much the same. Failed MP candidate, Nigel Farage, much in the same mould. You learn nothing from history, but a lot from the character of the people making promises. Much of the ruination of old buildings comes from the local people helping themselves to stone for their own building projects. Under Cromwell, there was some deliberate destruction of fortified manor houses, as the owners of these were mostly royalists. But this is a century later than Henry VIII. MacDonnell was a teenager in 1960's Liverpool, when Harold Wilson was the local de facto King. I recall being in the Everton Directors' Box after a good lunch with him, his cronies and others. Not long afterwards at the Free Trade Hall Manchester, the leading speaker, the new Sec of State For Education, was a Margaret Thatcher, again another lunch. It was a pity Mac' didn't make the trip the Manchester. On Bloody Mary. Macron is hell bent on repeating that approach. On Farage failing, we now know why. Illegal spending by the Tories. Then covered up. In my view, if you overspend as a candidate, even if found not guilty but its confirmed the overspend happened, there should automatically be a by election, and the guilty party has to refund the expenses to the losers. Cardinal Wolsey started the Dissolution while King and country were still solidly Roman Catholic. In Spain a little earlier there had been a wave of dissolutions directed by Cardinal Ximenez. Analogies break down a lot. What is this nonesense. No Brexit plan. So it’s the end of days. The break up of the Soviet Union! Oh woe. The corporates will steal all the wealth. Did that end in apocalypse or the dissolution of the workers rights? Remainers really need to get a grip. They are liable to give themselves the vapours. Prior to joining the EEC, Britain was dubbed the "sick man of Europe" with "spanish practices" and "french leave". We had to insult our neighbours rather than take a hard look at ourselves. Most of Europe had rebuilt itself through hard work, determination and the discipline of the single market. Now you want to throw this away. And is there panic in Europe over us leaving? Are they desperate for a deal? Seems not as France and Germany are planning even closer ties. And we haven't seen the EU show its full set of teeth yet when it makes a play for some of our key industries such as aerospace (JV), automotive (global players), pharma (global players) and finance (mainly US). You want to grow your economy by starting up a nice new industry? b) take a successful one from a close neighbour who sells a lot of that stuff to you. All you need to do is set the rules to advantage home turf, and wait. Anon - The Thatcherite reforms took us out of that. Is there no acknowledgement that we had determination and discipline too ? We didn't have Marshall aid to rebuild our cities - only debt and we were nearly always giving to the EU throughout our membership. The Tory Party calls us the extremists. The Thatcherite reforms took us out of that. Were you by any chance part of that "reform" where people were thrown out of their jobs and then beaten by the police (on overtime and perks) if they complained. Did you happen to stop people driving along, minding their own business, if there happened to be more than 2 males in the car. Been on "holiday" to a South American dictator state for "study"? Is this going to happen if you don't happen to have "settled status" - hounded from your home and job? A "reform"? That comment gets the withering contempt it deserves. It wasn't EU membership that made Britain The Fit Man of Europe. It happened to be a Europhile who coined the phrase The Sick Man of Europe. The first Project Fear if you like - FOMO. I recall Britain of the seventies and eighties and travelled its length by road often. Endless factories, most of them not on strike nor in dispute. Rather like today it is reported that the railways are on strike when only 8% of it is. Now (whilst in the EU) our country has done so well that it has decimated the police force while nobody fights for their jobs 'cause, well - outsourcing of work and importation of competition for the work that's left - it's what the EU does, innit ! Instead ordinary workers are picked on and beat up by May's Community Service retards, with near impunity as there are no coppers left to round them up and no prison spaces to put them in. So quit your Sth American dictator nonsense on a unicycle. We're nowhere near it and never were. ----- Andrew: Our Remain establishment has denied us the ability to 'set the rules to advantage on home turf' but please don't blame us for it not being so. Democracy is the river from which all good flows and it is clear now that we don't have it. This anon has followed radders here from his place. Willing to discuss. So you can engage. But only if you like straw.